The Colonial Theatre in Belfast is seen. Mike Hurley and wife, Therese Bagnardi, recently announced they are putting the theater up for sale. 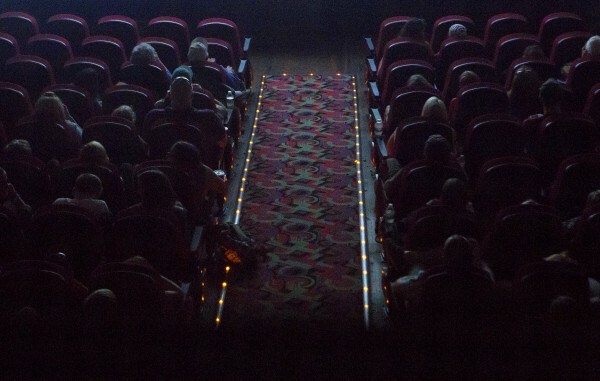 Patrons wait for their movie to start at the Colonial Theatre in Belfast. Mike Hurley and his wife, Therese Bagnardi, recently announced they are putting the theater up for sale. Kathleen Murphy (right) laughs with Terese Bagnardi while getting her movie tickets at the Colonial Theatre in Belfast. Bagnardi and her husband, Mike Hurley, recently announced they are putting the theater up for sale. Terese Bagnardi (left) sells movie tickets to Rogers O'Neill at the Colonial Theatre in Belfast. Bagnardi and her husband, Mike Hurley, recently announced they are putting the theater up for sale. Terese Bagnardi takes a moment to organize the tickets sales at the Colonial Theatre in Belfast. Bagnardi and her husband, Mike Hurley, recently announced they are putting the theater up for sale. Sally Joubert (right) laughs with Terese Bagnardi while getting her movie tickets at the Colonial Theatre in Belfast. 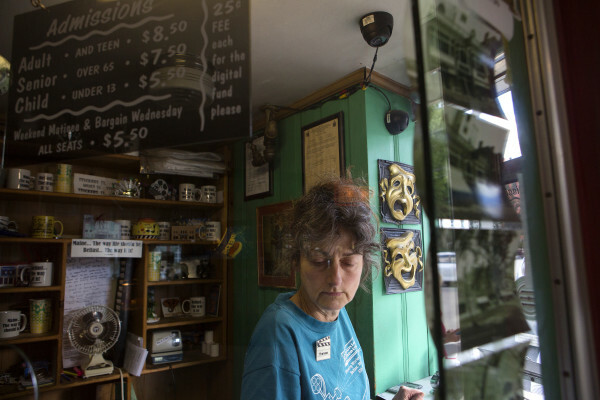 Bagnardi and her husband, Mike Hurley, recently announced they are putting the theater up for sale. 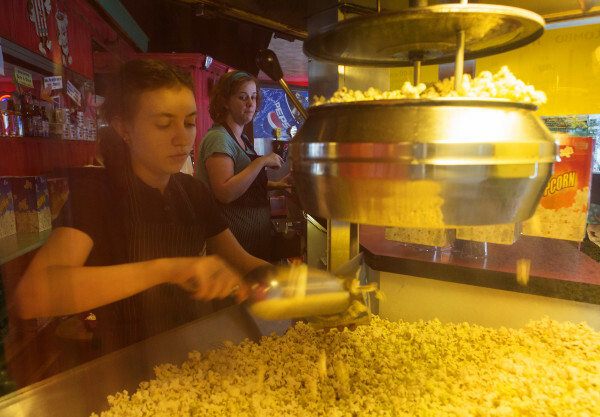 Heather Richardson adds butter to a bag of popcorn at the Colonial Theatre in Belfast. Mike Hurley and wife, Therese Bagnardi, recently announced they are putting the theater up for sale. 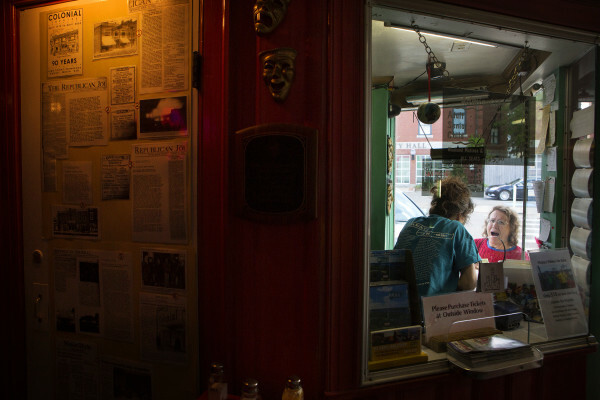 Heather Richardson (left) and Lindsay Bailey prepares snacks at the Colonial Theatre in Belfast. Mike Hurley and wife, Therese Bagnardi, recently announced they are putting the theater up for sale. 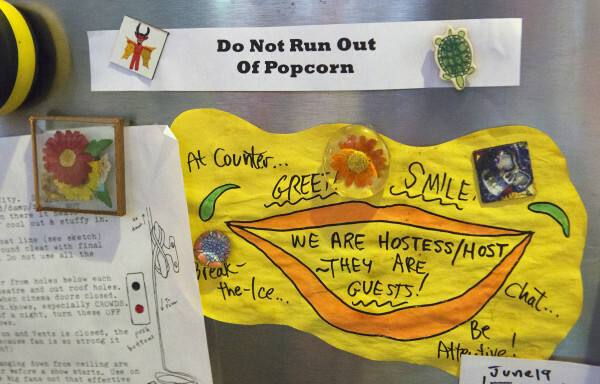 A sign reminding workers to not run out of popcorn is seen at the Colonial Theatre in Belfast. Mike Hurley and wife, Therese Bagnardi, recently announced they are putting the theater up for sale. 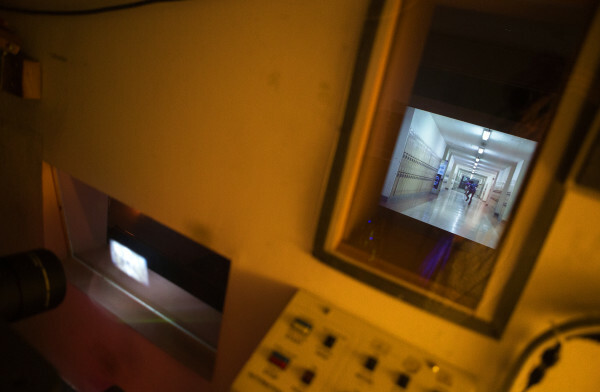 Previews are seen through the projection room at the Colonial Theatre in Belfast. Mike Hurley and wife, Therese Bagnardi, recently announced they are putting the theater up for sale. 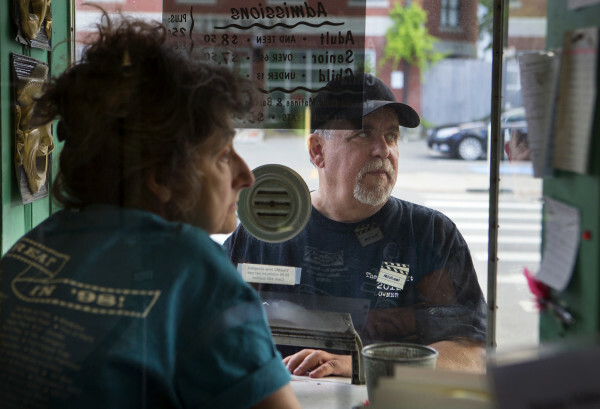 After many years, Therese Bagnardi (left) and husband, Mike Hurley, have decided to put their movie theater, the Colonial Theatre, in Belfast up for sale. 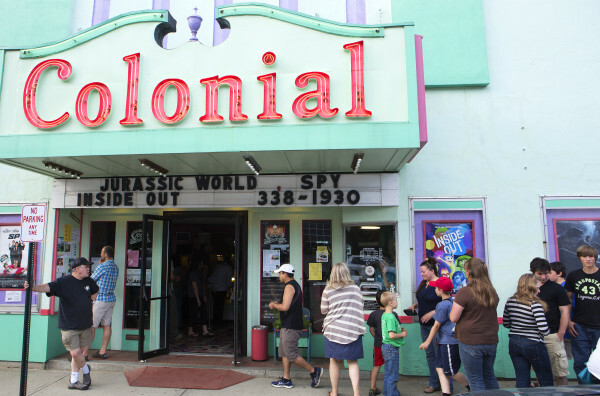 Movie goers enjoy a shot at the Colonial Theatre in Belfast. Mike Hurley and wife, Therese Bagnardi, recently announced they are putting the theater up for sale. Mike Hurley (left) greats movie goers to the Colonial Theatre in Belfast. Hurley and wife, Therese Bagnardi, recently announced they are putting the theater up for sale. Mike Hurley (left) greats movie-goers to the Colonial Theatre in Belfast. Hurley and wife, Therese Bagnardi, recently announced they are putting the theater up for sale. 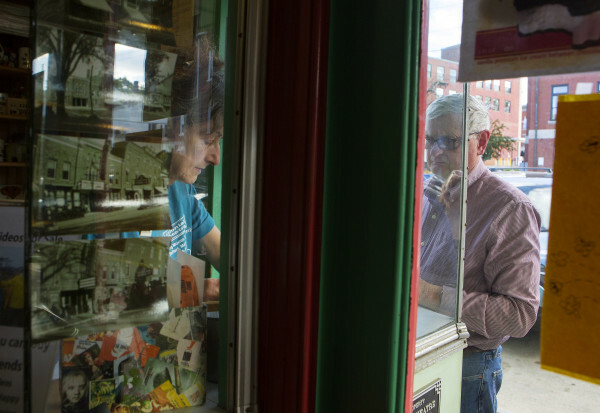 BELFAST, Maine — After two decades of renovation, innovation and great movies, Colonial Theatre co-owners Mike Hurley and Therese Bagnardi are putting their downtown Belfast icon up for sale. But they’re not in a hurry to hand over the vibrant art deco theater, the one with the fiberglass elephant trumpeting on top. Bagnardi and Hurley, who are married, purchased the Colonial in 1995, in what he described as essentially a whim tempered with luck. Bagnardi’s business was in a dry spell and she was looking for something to do. Hurley opened up the paper and saw the real estate ad for the cinema, which has operated on High Street since the day the Titanic set sail in 1912. The duo dove right in, first changing the then-two-screen theater’s color scheme from yellow and brown to the snazzy greens, purple and pink it is now. They fixed the neon sign that had broken out of the front marquee and then started in on the interior. They restored the lobby, which had previously featured a video rental business, and then got really creative and tunnelled underground to build a third theater, which they named “Dreamland.” All three theaters — Dreamland, Star and City — are named after the cinemas that dotted the downtown landscape years ago, Bagnardi said. The elephants came from Perry’s Nut House on Route 1, which at that time had closed and had its treasures put on the auction block. “Michael said we have to buy them,” Bagnardi recalled. When she asked him why, he told her they couldn’t leave town. And so they have stayed. Hawthorne, made of fiberglass, was put on the Colonial’s roof. Baby Hawthorne, made of wood and much heavier, was carried by local strong men to the lower lobby, where he remains today. Both Bagnardi and Hurley said that they follow the show business and that the show starts on the sidewalk. 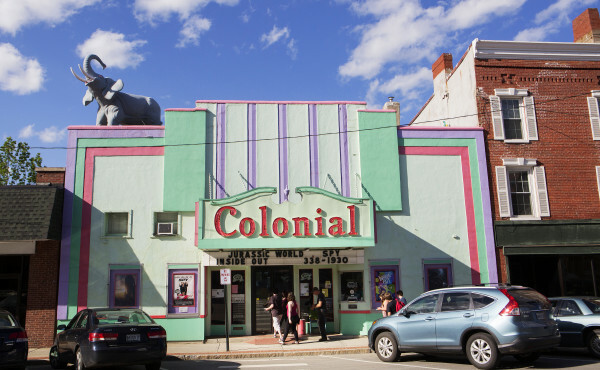 Liam Riordan, a University of Maine history professor and director of the University of Maine Humanities Center, said that downtown theaters like the Colonial matter a lot to the cultural lives of Maine communities. 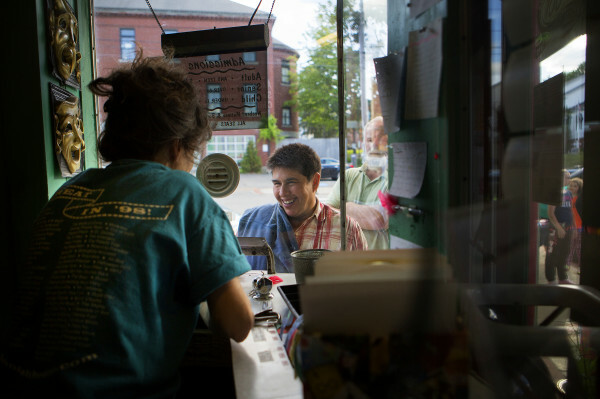 “I do think theaters have played an extraordinary role as a hub of local culture,” he said, mentioning the recently-reopened Criterion in Bar Harbor, the Grand in Ellsworth, the Alamo in Bucksport and the Strand in Rockland as some other good examples of early 20th century downtown theaters that remain relevant up and down the coast. All but the Colonial are now operated as nonprofit organizations. Although theaters in general may be under some pressure by the growing ease and availability of home entertainment options, such as streaming videos, he said that their location is critical. A few years ago, Hurley and Bagnardi had a big challenge when they were forced by the movie industry to convert from 35 millimeter film to digital prints. The digital switch was “extensive and expensive,” Bagnardi told the BDN in 2012. Some Maine cinemas couldn’t survive the switch. Maine Coast Mall Cinemas in Ellsworth shut down in January. 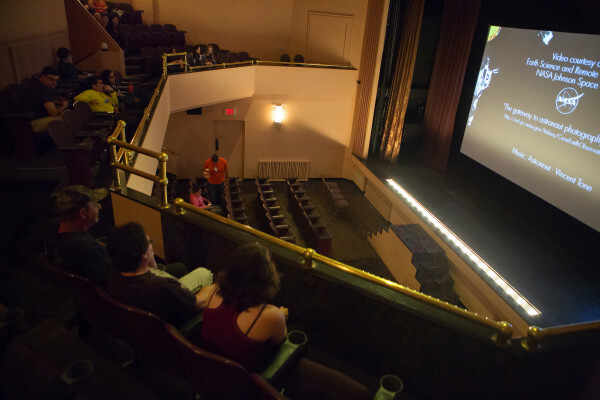 Casablanca Cinema 4 in Bethel showed its last film in September 2012 because it could not cross the digital divide into the future, according to the Boston Globe. 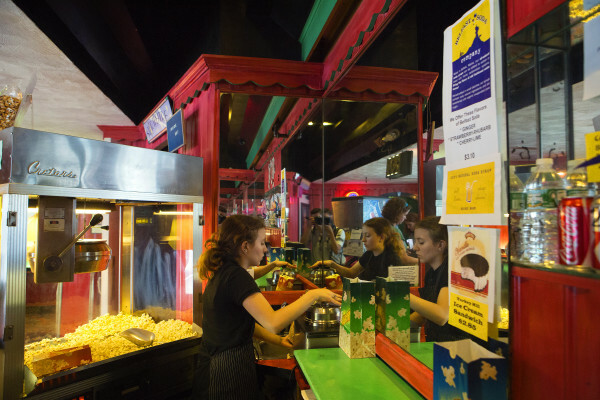 A seasonal movie house in Milbridge is likely to stay closed after the December 2014 death of its longtime owner Dave Parsons, who had been getting pressure from movie distributors to convert to a digital format. 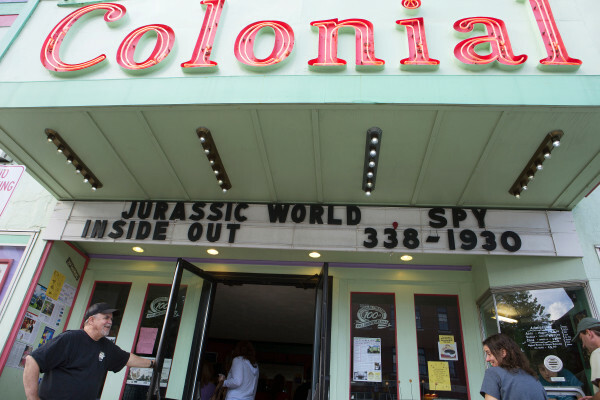 But the Colonial did it, with lots of help from the public, Hurley said, and that fact should put the theater in a good financial position for the next owners. When people ask him if the movie industry is in trouble, he tells them that 2015 is on track to be the highest grossing year in history in the country. And if the movies are doing OK around the country, they’re doing just fine in Belfast. The couple also is selling the Temple Theatre in Houlton. That two-screen theater is listed for sale for $350,000. The Colonial is more, with a list price of $2.2 million. 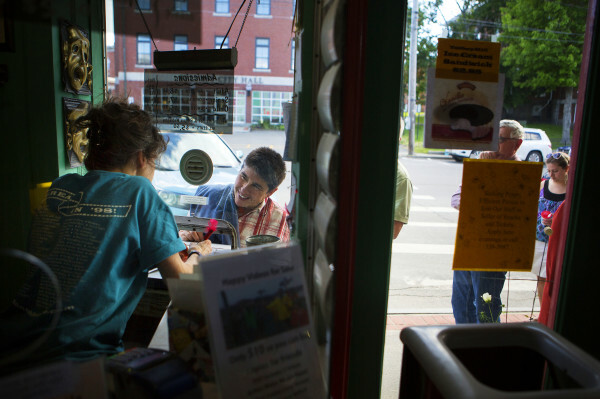 It’s valuable to the community, said Breanna Pinkham Bebb of Our Town Belfast, a nonprofit group whose mission is to grow and sustain the city’s historic downtown. Brook Ewing Minner, the new executive director of Northeast Historic Film in Bucksport, which runs the Alamo, said that the town supports its theater. That has especially been true as Bucksport weathers the recent sudden loss of its paper mill, which long has been the economic driver for the area. Both Hurley and Bagnardi said they hope that a Belfast buyer will see the value of the Colonial as a community hub. Although they show art and independent films there, they also show summer blockbusters and family fare.